Continuing on with my recent interest in reviewing unusual knives, the Zero Tolerance 0055 caught my eye for obvious reasons. This is an unusual looking knife. Designed by acclaimed Brazilian custom knifemaker Gustavo Cecchini of GTC Knives, the 0055 is a collaboration fusing the practical with the fantastical. I think right off the bat, to even consider buying a 0055 you need to be willing to make some compromises. This knife is not going to work like a “normal” regularly ground drop point. If you are buying a knife to replace your well worn Griptilian or Para 2, then you will want to look elsewhere for that foundation piece for your collection. The 0055 is further out there, for those seeking something different at the expense of pure practicality. It’s not a knife for the masses. With that caveat out of the way lets explore this unique offering from Zero Tolerance. The 0055 has an overall length of 8.75″, a 3.75″ blade, weighs 5.0 ounces, and is made in the USA. Despite being a larger knife, the 0055 feels agile for its size. It’s relatively thin, relatively light, and has a narrow profile. You can EDC it, but I’m not sure it’s something you will be able to easily use in public. It may be mistaken for a piece of Klingon hardware before being recognized as a utility knife. The blade is what I would describe as a modified reverse tanto. You don’t see many reverse tantos, the most famous of which is found on the Benchmade 940. Still, it can be a practical shape, marrying the utility of a drop point with the reinforced tip of a tanto. Here, the profile is modified so that there is no belly, almost an abstraction of an American tanto blade. Adding to the intrigue is a compound grind. My immediate reaction to the 0055’s blade was mild confusion, quickly met by acceptance for what it is. You have to suspend convention a bit to get into the spirit of this knife. It’s different. Otherwise there is no point to even considering the 0055. The blade is no doubt configured to fit into the equally angular handle. The compound grind is odd in that the thinner grind is towards the tip. That seems a little backwards, as generally speaking I think you would want a thinner grind towards the handle for detailed cuts, and for chores like cutting food and rope, but the thin tip section is good for cutting up cardboard boxes, although it can be difficult to orient this knife properly with your cutting medium due to the non-traditional blade shape. I will say that execution of the blade is nice. The grinds are even and precise. The edge has been nicely applied. The blade itself has been given an almost matte stonewashed finish. The quality is everything you would expect from Zero Tolerance. ZT decided on S35VN for the blade steel. S35VN is a fine choice for any higher end folder. I continue to appreciate the combination of easy sharpening, edge retention, and stain resistance that S35VN offers. It’s a fine steel and a worthy upgrade over it’s predecessor S30V. Having absolutely no belly to speak of, the 0055 is challenging to sharpen, especially if you want to maintain the crisp transition between the compound grind. This “inflection point” can get rounded over if you aren’t careful or decide to sharpen this on a rod sharpener like the Sharpmaker. You have to treat this like 2 separate edges to maintain the character of the factory blade, or otherwise you will slowly round this transition over like a rock in a stream. And ironically it’s not always easy to evenly sharpen a straight edge. It takes some care. The 0055 is not a knife for novice sharpeners, and wouldn’t be my first choice for a field knife. The handle of the 0055 is technically rich. The outer surface of the titanium handles has been intricately machined. Inside ZT has milled out the pockets to lighten the knife further. A decorative pivot and elegant blue floating backspacer holds everything together. The technical precision of Zero Tolerance is on full display here, and it’s that ability to execute that makes their products so consistently good. This handle is no exception. Everything is dialed in, from the finish on the titanium to the black hardware. There is not an errant machining mark, or jutting screw on this knife. Everything feels purposeful and controlled. The quality is unquestionable, so the real test is how you feel about the design. I happen to like it. The coffin shaped handle encapsulates the closed blade. It’s different, but cohesive. Gus Cecchini is a world renown knife designer, and his talents are apparent. Surprisingly, the 0055 feels natural in your hand. That angular handle design doesn’t look particularly comfortable, but it subtly cradles the palm of your hand, while your thumb naturally finds its way to the spine of the blade. Although the handle looks complicated, the lines of the handle are actually simple. What is odd about the 0055 is the placement of the edge. The edge pulls away from you, so depending on the task you may find yourself re-orienting the knife towards the cutting media. Not the most practical configuration, nor is it my favorite, but the 0055 is still capable of getting work done if you are up for the task. The pocket clip could have been an opportunity to really go off the deep end. Instead Gus and ZT went with a relatively simple spring clip. The shape is non-traditional, but not so far off the reservation that it becomes goofy. It also doesn’t have the typical “ZERO TOLERANCE” billboard, which is a welcome departure. The end result is a clip that compliments the knife, but isn’t remarkable. The 0055 caries well for a larger knife. Again, ZT has taken steps to keep the weight down, and it’s a relatively thin design. While this isn’t a deep carry clip, the knife carries unobtrusively. The only issue is that the framelock relief is right next to where the clip meets the handle, and I have found that the fabric of your pocket tends to bind up and get caught in the framelock relief. Not a deal breaker, and you could always swap the clip to the show side, but it’s worth noting. A part of what makes the 0055 unique to the production knife world is the use of Gus Cecchini’s Spring Loaded Tab (SLT) system. The SLT is a spring loaded flipper tab, which is used to open this manual flipper. You pull back on the tab lightly expose it, and then pull back with full force to release the blade like a typical flipper. I have found that the SLT system works great. At least in the short term. It successfully opens up the knife, is fun to use, stays out of the way a little better then a traditional flipper, and it doesn’t spoil the lines of the knife as much as a traditional flipper. The biggest con to the SLT system is that it’s more complicated then a regular flipper tab. Part of the beauty of a flipper is the simplicity. The SLT system is definitely an example of over engineering. It’s just like developing a special pressurized pen to write in space, when you can easily accomplish the same task with a pencil. Personally I enjoy the novelty of the SLT system on this knife. When it comes to man’s oldest tool, it has become increasingly tough to innovate. Here Gus has managed to create something different. Even if it lacks the elegance of a standard flipper, it has at least been nicely executed and it’s fully functional. The knife flips great, thanks in part to a robust detent and a smooth caged bearing system. I’d rate it a solid “8” on a 1-10 scale. While I wouldn’t want the SLT system on every knife, it is a big part of what made the 0055 interesting to me. For lockup we have a titanium frame lock with a steel lock bar insert. Just like on every other Zero Tolerance framelock I have reviewed, the lock has been beautifully executed. It’s rock solid and there is no blade play or lockbar stick at all. This continues to be something of a gold standard in framelock knives. The 0055 is a knife you will either connect with or dismiss, and it may take a while to grow on you. I happen to enjoy this funky design thanks in large part to Zero Tolerance’s brilliant execution. I think a lesser manufacturer would have a hell of a time getting away with a design like the 0055. Here the knife has been so finely tuned, that I couldn’t help but appreciate it. The 0055 is not a knife for a 1 knife collection. Hell, I don’t think it’s a knife for a 10 knife collection. The 0055 is a knife for fans of Gus Cecchini and his work, or fans of unique designs. If your collection is crowded with the work of designers like G&G Hawk, and Serge Pachenko, then the 0055 could be right up your alley. But if you are looking for a more traditional Zero Tolerance folder, then I have to recommend something like the ZT 0562. If the 0055 intrigues you, then I recommend checking it out. I have enjoyed owning mine, and appreciate it for it’s non-traditional nature. However, if you are considering this as your only premium pocket knife, then I’d suggest looking elsewhere. I recommend purchasing the Zero Tolerance 0055 at Amazon or BladeHQ. Please consider that purchasing anything through any of the links on this website helps support BladeReviews.com, and keeps the site going. As always, any and all support is greatly appreciated. Thank you very much. The Eraser is a relatively new offering from CRKT and is arguably their most ambitious knife yet. Designed by Liong Mah, this large tactical folder is his first knife collaboration with CRKT although Mah has collaborated with numerous custom makers in the past. Mah’s designs typically blend old styles with modern materials, and he maintains an emphasis on low maintenance and functional beauty. I must say, the Eraser certainly fits that bill. The Eraser is a large and heavy knife with an overall length of 8.75″, a 3.875″ blade, and a weight of 6.2 ounces. For some I imagine the weight will be a deal breaker but personally I had no problem toting this folder around – the trade off is you get large and extremely solid knife. As for intended use the Eraser is perhaps most accurately labeled as a “tactical knife” but could easily be used as a large utility knife or carried daily. I also think an argument could be made that this knife is collectible. While it may not be to everyone’s taste, the bold lines and beautiful finishes do offer something not commonly found in sub $100 knives. The blade is an intriguing reverse tanto shape, featuring beautiful grinds and a gleaming satin finish. It is an elegant and functional design, featuring a nicely reinforced tip, slight curving belly, and a broad hollow grind. This blade shape is a nice blend of form and function, marrying stabbing and slicing capabilities with graceful curves and hard angles. The steel selected here is AUS 8, a popular Japanese stainless. AUS 8 is a relatively soft steel (58-59 HRC) not known for extreme edge holding qualities, but I still think it’s a nice choice here all things considered. AUS 8 is known for being easy to machine and makes for a beautiful blade. The various grinds on this knife are crisp and wonderfully finished, it’s very difficult to believe that a knife this pretty retails for $80. Practically speaking AUS8 will gladly take a razor edge. Sure for some the still will not be exotic enough for their tastes, but with everything in mind I have no real issue with the choice. The Eraser features G10 handle scales with aluminum bolsters over full stainless steel liners with a partial G10 backspacer. Construction is very sturdy. Everything lines up well and is screwed together, and the overall fit and finish is impressive. The aluminum has been media blasted to a nice matte finish and you can see the subtle grain of the smooth G10. No doubt these nice materials also a bit of weight to the knife, but it makes for a classy and strong handle. Ergonomically speaking the Eraser’s handle is large and comfortable. For your more traditional forward / saber style grip the knife feels very natural with it’s wide modified pistol grip handle. The flipper doubles as a forward guard and there are contours for your fingers. It’s well thought out and quite comfortable. That said, where the Eraser really seems to shine is in a reverse grip. The back portion of the handle is heavily jimped and provides natural resting spots for your thumb and fingers. On the subject of jimping, this is a relatively smooth handle. For my purposes it works great (due to the design of the handle) but if you are part of the uber-tactical crowd don’t expect an Emerson or something. The pocket clip is long, bulbous, and has been given a discrete black finish. I’m not wild about the look of it, but I’ve also seen much worse. The good news is that we have a very capable clip here offering firm retention, a relatively low profile, and the option of 4 corners placement. As mentioned before, this is a large and heavy knife, and it carries as such. That said, it’s nothing ridiculous, and for its size I found the Mah Eraser to be a reassuring and comfortable carry. The Eraser makes use of a flipper for blade deployment and the near 4 inch blade glides along teflon washers. It took a maybe a couple flicks to break this pivot in, but I have since found the knife to open quickly and reliably with very little effort. Teflon isn’t always my first choice for washers but I have no complaints here and may even have come to like teflon washers a little bit (don’t tell anyone). It’s a very smooth and fast knife, and a lot of fun to open. Lockup is accomplished by an extremely sturdy stainless steel liner lock. There is absolutely no blade play at all in my knife, which I something I can’t always say – even about knives twice the price of the Eraser. Seriously, I am extremely impressed with the early and solid lockup. CRKT has also included their LAWKS technology which gives you the option to lock the knife open. It’s not a feature I use, but it stays out of the way and could come in handy for some. The Eraser is a very special knife. I love the lines of this thing, and the great use of materials. It is a bold design, obviously not to everyone’s tastes, but I love the fact that CRKT rolled the dice a little and produced something that steps outside the box. CRKT and Mah have taken the sub $100 production knife and elevated the ordinary into the extraordinary. Sure, there are lots of good blades out there for under 100 bucks, but few manage to fuse elegant design, high end materials, and beautiful finishes into a rock solid and highly functional folding knife like the Eraser. Of course I can’t blanket recommend this one as the absolute answer to everyone’s folding knife needs, but if you like larger knives and are a fan of the design then I think you will find a lot to like with the CRKT Eraser. I found the best deal for the Eraser on Amazon, although BladeHQ also has a good price. If you are as obsessed with knives as I am, you may be on the hunt for “the perfect EDC knife.” You know, the one blade that has it all. Naturally, it is the perfect size, features great materials, is beautifully designed, and carries like a dream. But in my mind a perfect EDC needs to go beyond that. It has to be greater than the sum of its parts, and a little “X factor” never hurt either. Lets be real, for a knife to earn some time in the rotation is one thing, but to stand the test of time the knife has to work for you on another level. That is what drew me to the Benchmade 940. On paper it has all the basic requirements of a good EDC knife, which is always nice to see. But then the 940 had something else. Maybe it’s the unique handle, or the unconventional blade shape. Whatever it was, it drew me in like a moth to a flame, and I know that I am not the first to succumb to this emerald beauty. The 940 has been in Benchmade’s catalog for well over a decade, and remains one of their most popular designs to this day. Needless to say, it is high time we gave this classic a thorough review. The 940 (or “940 Osborne”) has an overall length of 7.87″, a 3.4″ blade, and weighs 2.90 oz. In my mind these are real nice numbers for EDC, and that is exactly how I have been using my 940. But I can also appreciate how the 940 could go beyond a mere EDC item. First of all, this is a wicked little knife. With an almost 3.5″ blade and an equally generous handle, the 940 could easily be pressed into a self defense role (although I sincerely hope you will never need to use it that way). On the opposite end of the spectrum, the 940 is a beautiful and elegant knife. In many ways exemplifies a modern gentleman’s folder. This is a knife that would do just fine in a suit pocket, or carried on special occasions. So I really like the versatility of the 940. It is fancy enough to make for an upscale EDC, but has enough bite to be seriously considered as a self defense option. The blade on the 940 is a reverse tanto design. Popularized by the 940’s designer, Warren Osborne, this unique blade shape is best known for providing a sturdy tip, although I think the main draw is just the unique aesthetics. Warren has designed a few reverse tanto models for Benchmade, including the Benchmade Rift and I have generally been impressed by them. This particular blade has been given a high flat grind, and features a swedge running across the top. The 3mm thick blade holds it’s thickness pretty much to the tip thanks to the reverse tanto design. This is an interesting blade shape, and I found it quite capable for all my daily tasks. 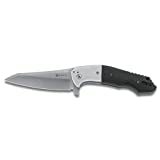 The 940 Osborne makes use of S30V for the blade steel, an excellent USA made stainless from the folks over at Crucible. I have spoken about S30V many times before, but as a quick recap S30V is widely regarded as one of the best high end steels commonly found on production knives. When properly heat treated S30V is known for good edge retention, high corrosion resistance, relatively easy sharpening, and a good level of toughness for daily use. I am a big fan of S30V and Benchmade always does a fantastic job with heat treating their blades. Treated to 58-60 HRC, this 940 was no exception. The handle on the 940 is where things start to get interesting. First you have the striking aluminum handles. These have been bead-blasted to an attractive matte finish, and then anodized a deep green. I absolutely love the texture of these handles. They aren’t particularly aggressive, but they aren’t slippery either – given the intended use I found it to be a nice balance. Sandwiched between the aluminum handles is a single piece of anodized purple titanium. This backspacer compliments the green handles nicely, and provides a good deal of visual interest. As for actual construction, the 940’s handle is top notch. There are partial stainless steel liners, and they have been polished to a lustrous shine. I like how when you peer inside the knife the liners reflect the titanium backspacer. It is a little detail, but some times it’s the small stuff that gets you going. Everything has been screwed together with black hardware, and all the pieces line up perfectly. The overall fit and finish of this knife is exceptional. In 2015 Benchmade released the 940-1, a premium version of the 940 with carbon fiber handles and a S90V blade. It’s a beautiful knife and well worth considering if you are a fan of the original 940. Check out our review of the 940-1 here. In hand the 940 is surprisingly capable. I say “surprisingly” because at a glance we have a rather thin handle here. In practice I found the handle long enough to comfortably accept my larger hand, and the rows of jimping on both the thumb ramp and finger choil provide a good amount of grip. It is a comfortable knife in forward grips, and I can get some good work done with it. The 940 also works well in reverse grip, and in the closed position as well. Actually, when closed, the 940’s thin profile makes it an excellent choice as a kubotan – another nice option to have. The pocket clip on the 940 Osborne is a standard Benchmade clip – the same kind you will find in models like their classic Griptilian and Mini Griptilian. I am a big fan of this style of clip. It is simple, sturdy, and works quite well. Benchmade drilled and tapped this model for ambidextrous tip up carry. In pocket the 940 carries wonderfully. Thin and lightweight, this is a knife that you forget you are carrying. The 940 makes use of a pair of ambidextrous thumb studs and an axis lock. Much like many of the other Benchmade knives that I have reviewed with this configuration, deployment on the 940 is extremely fast and smooth. The thumb studs are easy to access allowing you to flick the blade out with alarming speed and very little effort. Phosphor bronze washers aid in that regard, and the net result is reliable deployment in any situation. Similarly, the axis lock on my knife has also been really well done. Lockup is tight with no blade play, yet the lock is easy to disengage with a single hand, and the blade rotates freely into the closed position. It is no secret I am a big fan of the axis lock, and the 940 is a great example of why. If true one hand operation is important to you (as a righty or a lefty) then I find the combination of thumb studs and an axis lock very tough to beat. The 940 combines excellent materials with smart design and wonderful fit and finish to produce an exceptional daily carry item. On paper this has always looked like an awesome knife, so I was very happy to find that the 940 was just as awesome in real life. Everything works, and it works well. The way I see it, the biggest potential downside here is that the knife isn’t particularly cheap, but for a made in the USA folder with these kinds of features, I actually think the price is quite reasonable. But what about beyond the specifications? Do we really have a “perfect” EDC knife? I must admit, there is something special about this one. The 940 has really distinguished itself as a design and it has a little something extra that keeps me coming back. I don’t doubt that for many people this will be a perfect EDC knife. 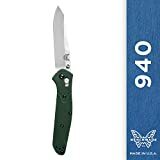 I recommend purchasing the 940 at Amazon and BladeHQ. Buying anything through the links on this website earns BladeReviews a small commission at no additional cost to you. All proceeds generated are used to keep the site running. Thank you very much for your support.